For the most reliable charter bus and minibus rentals in Long Beach, call Champion Charter Bus. As one of the top-rated charter bus companies in the state of California, we can accommodate groups of any size for trips of any kind. Our team is ready to help you plan your trip 24/7 when you call us at 562-321-9021. No matter where you’re going in Long Beach, California, Champion Charter Bus can make transportation the easiest part of your entire trip. Our expertise has helped arrange reliable, efficient transportation for groups of all sizes and trips of all kinds. Ride with top-rated amenities like reclining seats, air conditioning, TVs with DVD players, WiFi, power outlets, and more. Our network of modern bus rentals ranges from 18-passenger minibuses to full-sized 56-passenger motorcoaches, making it easy to accommodate any group. With services in major cities like Los Angeles, Sacramento, San Diego, San Francisco, San Jose, and more, you’ll never have trouble transporting groups again. Call our 24/7 team at 562-321-9021 to learn more! Don't know where to start when planning your trip to the Los Angeles area? We've got all the information you need with a sample itinerary, or you can call our helpful reservation team at 562-321-9021 for expert advice. Whether you’re in town for a special event or on a private vacation, one thing’s for sure-- you’ll want an easy way to travel through Long Beach’s busy streets. Champion Charter Bus works with you to find the right transportation solution for your specific trip and group. Forget dealing with traffic, confusing roads, and parking when you can leave it all to us. Planning an amusement park trip to Knotts Berry Farm or trying to get spooked on The Queen Mary? Perhaps you’d rather soak up the sun on the beach or go shopping. Whatever your plan consists of, focus on the fun parts of your trip and let Champion Charter Bus help you get there. With complete freedom to plan your trip your way, you can explore Long Beach exactly on your terms-- we’re just here to do the driving. Want to travel outside of Long Beach? Champion Charter Bus services major cities across the entire West, including Denver, Las Vegas, Phoenix, Aurora, and more. We’ll also help you travel anywhere in the U.S. with your group. Don’t settle for an old school bus at your next school event. 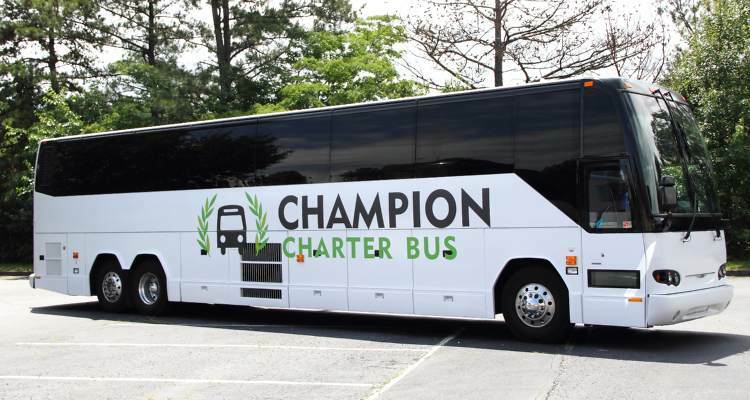 Champion Charter Bus can show you how to enhance your next ride with reliable charter bus rentals both students and chaperones will both love. From field trips and away games to greek events and campus tours, traveling with a large group of students can be more organized, less stressful, and an enjoyable experience for all. Your entire group will ride in complete comfort to your field trip to Los Cerritos Ranch House for a tour. Stay comfortable on short and long trips with reclining seats and plenty of legroom, entertain everyone with TVs and DVD players, and prevent additional rest stops with on-board restrooms. Your class can focus on learning and having fun while your driver provides a safe ride the entire time. Campus tours are easy to manage with a minibus rental. Tour your students’ top college picks like California State University, Long Beach City College, and any other colleges with a personal ride dedicated to your group. Your driver will know the most efficient routes and the best places for drop-off and pickup for a completely seamless process. Transport your local sports team to their next game or event in a clean, comfortable bus rental. Safely store all your luggage and sporting gear in the storage bays, and prepare for your next victory without ever having to look at the road. We’ll help you on your way to becoming champions. Okay, planning an event is never that easy, but with Champion Charter Bus, transportation for your attendees is one less factor you’ll have to deal with. We know how to efficiently transport large groups to and from events for a completely organized and punctual process, and we can help keep your attendees moving while you focus on the rest of your event. Transport employees and clients to the Long Beach Convention & Entertainment Center in a professional all-black or all-white bus rental. Instead of arriving late due to public transportation, cabs, or rideshare apps, your entire group can stay organized and arrive on time together. Worried about missing any major deadlines? Request on-board WiFi and power outlets to ensure everyone stays productive on the road. Stressing over how all your wedding guests will arrive on time for your celebration at The Ebell Club of Long Beach? Shuttle your guests to and from their hotel or parking lot to your event in a stylish minibus. Each wedding guest can forget worrying about navigation, parking, and arriving late, and you can celebrate knowing everyone will have a safe, dedicated ride back. There’s a reason Champion Charter Bus is California’s top-rated charter bus company, and we’d love to show you why. Our 24/7 customer support and variety of reliable bus rentals make planning a casino trip, senior outing, and any other kind of trip easy. Call us anytime at 562-321-9021 to see how we can help you.